Lake-Monroe.com is operated and maintained by a local organization, and not the Indiana Department of Natural Resources. Indiana's largest lake, near the Indiana University campus, features a scenic stone-bluffed shoreline and wooded hills. Monroe Lake is located in south central Indiana. 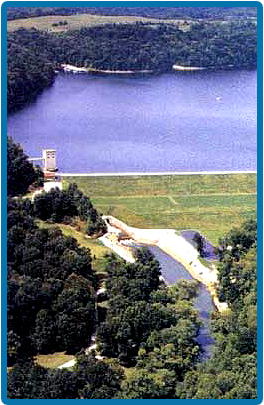 The lake was completed by the Corps of Engineers in 1965. While this area of southern Indiana is known as the "The Limestone Capital of the World," at one time it also had several salt deposits, creating a lucrative trade by rafting the mined salt down the creek that would one day become Monroe Lake. Hence the name, Salt Creek. Monroe Reservoir is 10,750 acres water with 23,952 total. 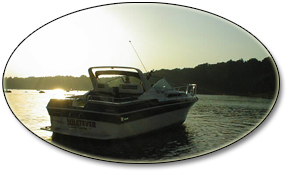 Lake Monroe has three state recreational areas: Hardin Ridge, Paynetown, and Fairfax. The lake is served by a full service marina. The Monroe Lake area was, until the early 1700's, undisputed Miami Indian land, even though occupied by both the Miami and Delaware tribes. The lake area was acquired legally from the Indians as part of Harrison's Purchase, by the Treaty of Fort Wayne, on September 30,1809. The first recorded white settlers arrived in 1815, but were undoubtedly preceded by hunters and refugees from the law. A typical landholder farmed a few acres claimed from the woods and harvested the plentiful wild game of the area. Many of the original settlers were thrifty and industrious, although squatters and land speculators abounded, seeking to make a fortune in the new territory. The rolling hills of southern Indiana produced tremendous amounts of lumber from native stands of poplar, maple, cherry, walnut, and ash. Forest clearing allowed development of a farming economy which still a local mainstay.